While the European Union banned the use of antibiotics for growth promotion in 2006, little action has been taken in the US. In fact, the Food and Drug Administration (FDA) has essentially given Big Ag a free pass by merely recommending “voluntary” reductions in antibiotic use. The discovery of penicillin in the 1920’s was a medical breakthrough. Who of us hasn’t relied on antibiotics to cure an infection at some point in our lives? Yet, today in the US, 80% of antibiotics aren’t used to treat people – they’re fed to factory-farmed animals. 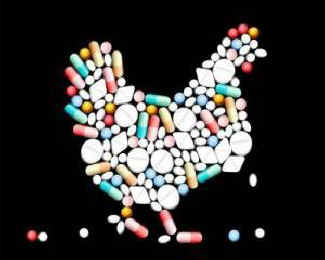 For decades, Big Ag has been pumping these drugs into animals as a way to boost abnormally fast growth and to mitigate the spread of disease caused by filthy, overcrowded conditions on factory farms. If these trends continue, antibiotic-resistant infections will kill 10 million people a year by 2050. Despite the clear danger in pumping large quantities of antibiotics into farmed animals, global antibiotic consumption is predicted to grow 67% percent by 2030. That’s why earlier this month, US Congresswoman Louise Slaughter, who is the only microbiologist in Congress, re-introduced legislation to stop Big Ag’s overuse of these critically important drugs. You can make a difference today: the best way to protect ourselves, public health, and animals—is to choose plant-based foods. Visit TryVeg.com to get started.